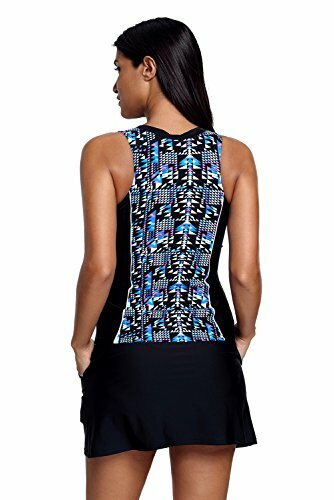 Tankini and skirted swimsuit with contrast printed panel accent to flaunt your beautiful figure perfectly. Full encircled shelf bra with soft, wire-free molded cups, tank top styled with front zip closure, wide straps offer full bust support. Relaxed fit. A-line swim skirt with attached brief, wide waistband with high elasticity, pocket side design. Stylish print detail make it unique. Tankini top has zip closure on the front. Skirted swim bottom with attached brief. The comfortable fabric provides all over total control to shape and firm. 1x Tankini Top and 1x Bikini Bottom. Stylish contrast printed,comfortable fabric provides all over total control to shape and firm Soft bra padding and wire-free molded cups,wide straps offer full bust support Relaxed fit,zip closure on the front,perfectly designed to smooth and flatter your curves A-line swim skirt with brief attached,wide waistband,side packet design Perfect for Tropical Vacations, Summer, Beach & Pool with unique and chic pattern.